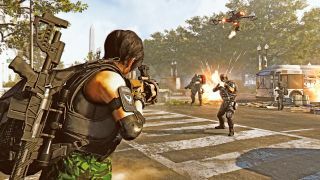 The Division 2 has some of the best enemy AI in any cover-based shooter, but at higher difficulties its enemies develop a bad habit of blindly rushing toward you, face-tanking your bullets all the while, before totally surrounding and then murdering you. As Massive community dev Chris Gansler recently explained, this overly aggressive behavior is partly due to a bug with the AI. "There's currently a bug where the enemy AI doesn't properly register your scaling," Gansler said on Reddit. "To be blunt: They think you're low (on health, not skill. We all know you're doing your best) and the AI should try to pressure you when this happens. We're looking at fixing this as soon as we can and this should decrease the amount of rushing you're experiencing (for those NPCs that are not rushers)." Some Division 2 enemies are explicitly designed to get in your face. The "rushers" Gansler refers to often wield shotguns and melee weapons, and they're supposed to draw your attention and force you to change positions. That's all well and good; rushers help spice up shootouts. The trouble is, due to the bug Gansler described, more and more enemies are adopting the rusher lifestyle, especially in World Tier 5. This can create hopeless situations where you're constantly surrounded. You know that moment in a tower defense game when there are enemies swarming your crystal because your defenses didn't hold? It's kind of like that, except all the time and you're the crystal. So, hopefully this bug is fixed sooner rather than later. As Gansler explained, Massive is also looking into other ways to make shootouts feel less punishing without sapping the challenge from them. "We absolutely don't want to nerf anything to the ground and expect challenging and heroic to still be very difficult," he said. "But if we see things that just don't feel right, we do want to address them. We will however also not stop after we did an adjustment. If the overall feedback is 'Hey, this is now way too easy' we can tune it back up." Gansler said overall survivability "sometimes doesn't feel great" and may see some changes. He also outlined a more specific change: increased protection while sprinting and moving between cover. "This should help the feeling that running away to re-position is basically a death sentence," he said. These Division 2 tips will help you stay alive no matter what difficulty you play on.